Posted on Sun, Feb 5, 2012 : 5:45 a.m.
Music + Movies = Martin. OK, that’s not an exactly an equation on the level with E = MC2 in terms of profundity, but it neatly sums up two of the prevailing passions I’ve had ever since I was a kid. And thanks to the generosity of Russ Collins, our much-loved CEO and executive director of the Michigan Theater, I have the way-cool opportunity to combine music and movies in a film series which begins tomorrow night at the Michigan. Martin Bandyke’s Moving Pictures kicks off Feb. 6 at 7 p.m. with the Ann Arbor premiere of “The Anatomy of Vince Guaraldi,” a fascinating documentary about the jazz pianist best known for writing the music to the television special “A Charlie Brown Christmas.” I’m old enough to remember when it first aired in 1965, and clearly recall how captivated I was by both the Peanuts characters and the swinging Vince Guaraldi score. Director Andrew Thomas uses rare archival footage along with contemporary interviews to explain how Guaraldi sprung from obscurity to fame, and you’re sure to enjoy the observations of people like Dave Brubeck, Jon Hendricks, George Winston and many others. Let me quickly take you through the rest of the films that will unspool in February at the Michigan as part of the series, starting with the Feb. 13 screening of “I Am Trying To Break Your Heart.” This riveting 2002 documentary about the recording of Wilco’s album “Yankee Hotel Foxtrot” is filled with drama from start to finish, as band-members Jeff Tweedy and Jay Bennett find themselves increasingly at odds, Tweedy battles debilitating health issues, and then the band’s label refuses to release the completed album on the grounds that it’s too weird and won’t sell. Melies was one of the most innovative directors in the early days of cinema, and his 1902 masterpiece “A Trip to the Moon” will be screened in all its painstakingly restored glory. For the film’s 2011 reissue, the trippy duo Air has written a surreal new score that nicely complements the visuals. We’re pairing “Trip” with the 2007 documentary about British post-punk pioneers Joy Division. The quartet was short-lived but influential, recording only two studio albums before lead vocalist Ian Curtis committed suicide on the eve of his band’s first tour of the U.S. The surviving members of Joy Division formed New Order, one of the most popular groups of the 1980s, and all give insightful, emotional recollections of fallen friend and band member Curtis. The spine-tingling concert footage of Joy Division is by itself worth the price of admission. For Feb. 27, we’ll screen a rare, 35mm print of “8 Mile,” the Oscar-winning Curtis Hanson film starring Eminem, who plays a rapper very much modeled after himself. The film’s indelible theme song “Lose Yourself” is heard these days in a series of compelling Chrysler ads. Martin Bandyke’s Moving Pictures just happens to coincide with the start of my 30th year as a radio host, and I couldn’t be more thrilled to present these films at the historic Michigan Theater. The series continues through the end of April, with much more information available at www.michtheater.org. 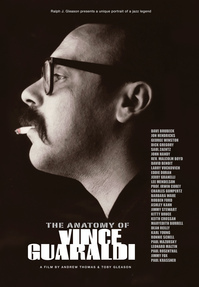 I’ll be at the Michigan tomorrow night to host “The Anatomy of Vince Guaraldi,” so “Cast Your Fate To the Wind,” stop on by and say hello. Martin Bandyke is the 6-10am morning drive host at Ann Arbor's 107one. Follow him on Twitter, Facebook and at www.martinbandyke.com. Tue, Feb 7, 2012 : 9:15 p.m. I thought this film was perfect in every way. It put a bright light on a career that was years in the making and depicted a complex and thoughtful man. Looking forward to the other selections in this film series.